As consumer behaviors have changed, it is our job to evolve to deliver the customer experience that our customers expect. 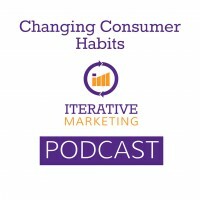 In this podcast, we outline the four ways we can meet this new challenge and discuss how it affects marketing and advertising at large. Many consumers are connected 24/7 to the Internet through their smartphone and are inundated with information via news, social apps, text messages and push notifications. Information is available instantaneously from a variety of different technologies. Consumers no longer seek authorities for information, they seek aggregators. Aggregators, like Facebook and Netflix for example, filter the information and entertainment consumers care about and cut through clutter. To adapt, marketers should place advertising on publications that aggregate information and attract consumer attention. We are no longer focused on placing ads based on the authority of the publication. Programmatic media buying is meeting this need and is trumping direct buys in publications. Marketers should no longer think of their blog as a destination, but rather a bucket of information to distribute to other channels. Consumers know personalization technology exists and they expect their favorite brands to deliver on that. Marketers should provide experiences to the prospect or customer based on the signals they show us. We can do this by segmenting our content to cater to our audience’s needs or place in the customer journey. Consumers have grown accustomed to servicing themselves digitally and on their own time, rather than the schedule of a customer service or sales representative. Many consumers will read and research online before interacting with a sales person at all. We can meet this need by giving consumers the content they need to learn about our product or service on their own time. We should strive to humanize the content so that, even digitally, consumers can make an emotional connection with our brand. Digital has amplified word-of-mouth and increased its frequency. We call this the Ultimate Moment of Truth, that moment when a prospect converts and has the opportunity to share their experience with others. Word-of-mouth is seen in product reviews and dark social. Dark social is the untrackable conversations that occur about our brand. Negative reviews aren’t always bad for brands. We should use negative reviews as a chance to show consumers how we have resolved the issue moving forward. Southwest Airlines is great at this. We can influence dark social conversations by giving customers the words to use to talk about our brand through brand advertising. We need to reinforce the attributes we want our prospects and customers to talk about as brand advocates.